It appears that the battle for Donetsk has begun and that the war in eastern Ukraine is coming to a decisive head. My guess is that Kyiv has decided to take advantage of the downing of MH-17 by pressing ahead with its offensive against the rebels and will try to defeat them decisively in their stronghold, the city of Donetsk. Since driving the separatists out of Slavyansk and Kramatorsk, the Ukrainian offensive has concentrated on the salient between Donetsk and Luhansk (see map) and on gradually encroaching on separatist-controlled territory on the outskirts of Luhansk. Today, the Ukrainian military is reporting that its forces have taken the towns of Rubizhne, Dzerzhinsk, and Soledar (see map), have tightened their noose around Horlivka, and are attacking in the vicinity of the towns of Lysychansk and Sievierodonetsk and the suburbs of Luhansk and, most importantly, Donetsk. The spokesman for the Ukrainian Security and Defense Council has stated that Ukrainian forces have been ordered to avoid air and artillery bombardments of civilian areas in Donetsk and Luhansk. While that may be true, it is already clear that that order cannot be carried out literally. 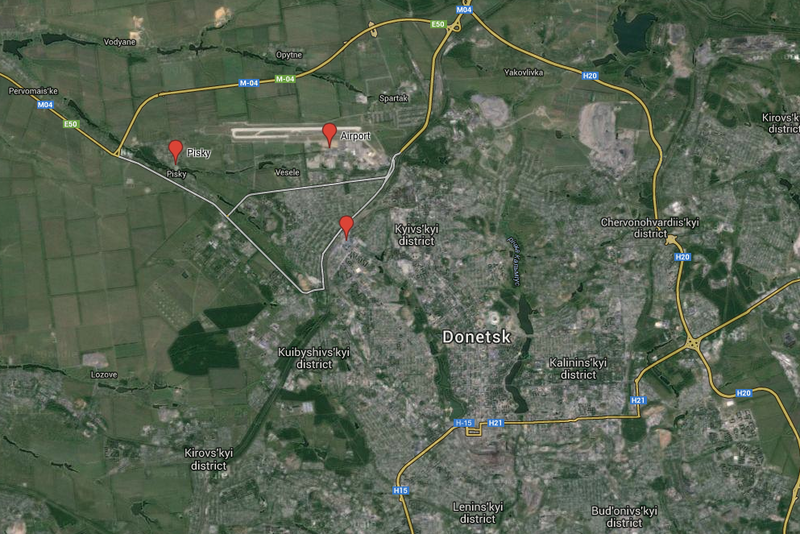 Ukrainian forces are pressing into Donetsk from the northeast and have reportedly entered the suburb of Pisky (see map). There is video evidence and journalists’ reports of explosions and shelling near the airport and in the vicinity of the railroad station (see map). A Western reporter has tweeted that a Ukrainian Su-25 launched an attack near the railroad station immediately after the train carrying the remains of the victims of MH-17 left for Kharkiv. And there are reports that at least five civilians have been killed in Donetsk in the past 24 hours. A great deal now hinges on whether the Ukrainian military can take Donetsk quickly and without causing many civilian casualties. The difficulty the Israeli military has had entering Gaza is a reminder of how challenging it is for organized militaries to take urban areas from determined irregulars. My guess is that whether the battle for Donetsk proves bloody and/or prolonged versus short and less destructive is going to depend largely on the morale and determination of the separatists. That morale may well have been undermined in recent weeks by their battlefield loses, by the refusal of Moscow to intervene directly, and by the downing of MH-17. A video posted today on Youtube includes commentary from a separatist fighter indicating that his fellow fighters had fled one of the towns in the north, and there are other reports that tens of separatists have been captured today by the Ukrainian military (including, oddly if true, a defense official of the Russian protectorate of South Ossetia). There is also photographic evidence of a large column of armor and military vehicles leaving Donetsk, which is reinforced by a Tweet from a Western freelance journalist and photographer, Noah Sneider, who reports seeing on a column of tanks, armored personnel carriers, buses, and cars, consisting of around 50 vehicles, leaving Donetsk and heading east, away from the Ukrainian forces and along the main road leading to the Russian border. None of this, I should emphasize, is decisive evidence that a route of the separatists is underway, but at the least it increases the probability that Kyiv will be able to take the city quickly. If so, the window of opportunity for Russia to intervene may be rapidly closing. Already the costs to Moscow of intervening have gone way up from what they would have been three months ago. The Ukrainian military is in a much better position to resist, the level of international outrage at Russia for its actions in eastern Ukraine and especially for its role in the downing MH-17 is sky high, and claims that the intervention would be for “humanitarian purposes” would be believed by virtually no one outside of Russia. That said, it also true that a decisive victory for the Ukrainian military over the separatists is going to be viewed by the Kremlin as a potential disaster for its geopolitical ambitions. For the Kremlin, the risk is that the Ukrainian military seizes Donetsk and Luhansk quickly (say, in a couple of weeks), establishes operational control of the conflict zone, and more-or-less secures the border with Russia. If so, the Kremlin will assume (probably correctly) that Western countries, notably the United States and Poland, will gradually take steps in the coming months and years to help Ukraine (and Georgia as well) improve their defense capabilities by providing lethal equipment like anti-tank and air defense systems, as well as training and other forms of defense cooperation. The Kremlin will also likely worry that the Russian position in Transnistria is going to become increasingly vulnerable. And finally, it will assume that NATO will gradually improve its ability to defend its eastern borders, including in the Baltic states, and eventually take in new members, notably Moldova and possibly also Finland and Sweden, and eventually even Ukraine and Georgia. How the Kremlin reacts to all this is anyone’s guess. The problem is that there is no obvious exit option for Putin, which in my view makes an already very dangerous situation even more dangerous. It may be that the Kremlin is still hoping that the separatists make the battle for Donetsk bloody enough and long enough to induce Kyiv to agree eventually to a ceasefire and some kind of negotiated settlement. Short of that, I think there is very little likelihood that Kyiv will stop its offensive unless the separatists agree to lay down their arms and surrender. But long and bloody battles in Donetsk and/or Luhansk are still decided possibilities. At any rate, the Kremlin may yet decide to intervene. Ukrainian military sources and Western intelligence report that Russia has been been moving more forces towards the border with Donetsk and Luhansk oblasts in recent weeks, and today the Ukrainians are reporting an increase in the Russia troop presence in northern Crimea. They also claim that Russia is placing mines in some parts of the Sea of Azov. ← Who and what brought down MH-17?